At the IOCDF, we understand that it can be expensive to attend our Annual OCD Conference, especially if you will be traveling a long distance or paying for your entire family. For that reason, our dedicated staff works hard to keep costs manageable and ensure that you get the most bang for your buck at the Conference. Attractions & Discounts in Washington, D.C.
Foundation, Professional, and Student/Trainee Members of the IOCDF receive discounted registration to the Annual OCD Conference for themselves and everyone in the immediate household! Click here to learn more. Have you ever wanted to bring your family with you to the Annual OCD Conference, but decided not to because it did not seem cost-effective? We actually have a special discount available for larger families who want to attend the Conference as a group. Families of four or more people who currently live in the same household are eligible to register for the Conference at a special rate of 15% off of the member rate, so long as at least one member of the household holds a current IOCDF membership. This discount has significantly helped large families attend the Conference in previous years. OCD involves the entire family, and we want to make it possible for you and your loved ones to attend this life-changing event. The family discount is not available online; for more information about this opportunity and/or to register your family of four or more today, please call us at (617) 973-5801 or email us at conference@iocdf.org. 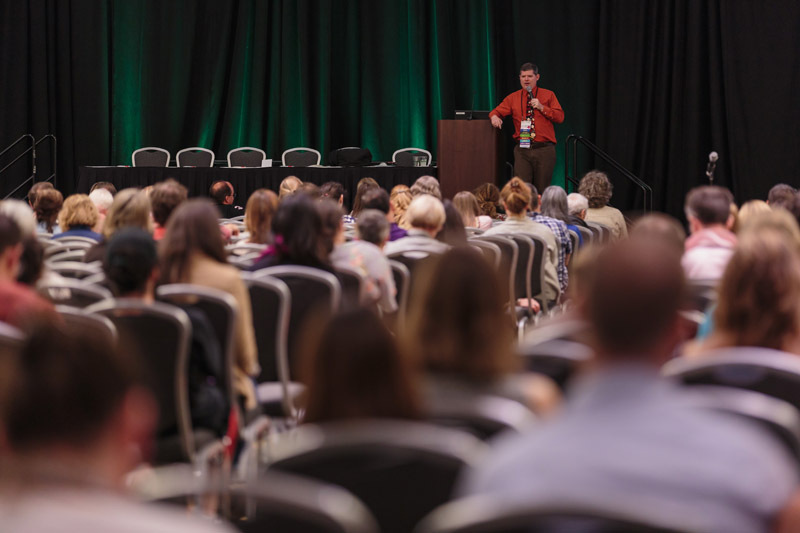 Volunteers are vital to the success of the Annual OCD Conference — the IOCDF would not be able to run the conference without their support and dedication. Every year, we require approximately 40 volunteers to fill four (4) different roles: Room Monitors, Navigation Guides, Registration Assistants, and Youth Programming Assistants. Volunteers receive a discounted registration to attend the Conference, but are responsible for paying for their own travel, hotel accommodations, and meals. Volunteering is a wonderful way to attend the Conference on a budget, while also helping the IOCDF run a great Conference. Please note that there is an application process for all volunteer positions. Click here to learn more about volunteering at the Conference. Thanks to the generosity of our many donors, we are able to offer a number of Conference scholarships to attendees who otherwise would not be able to attend. The Conference Scholarship Program allows for low-income individuals and families to attend the Annual OCD Conference at a discounted rate ($50 registration per person — this does not include travel, accommodation, or meal costs). Click here to learn more about applying for a scholarship to attend the Conference. If you would like to learn more about the Conference Scholarship Fund and make a contribution, please click here. Every year, we work with our host city and the Conference hotel to secure discounts on everything from local tourist attractions in the area, nearby restaurants, and transportation (shuttles, taxis, rental cars, etc.). We are currently working on finding some great discounts in Austin, TX! For those traveling to Austin just to attend the Conference, as well as for those who will be making a larger vacation out of the trip — there will be discounts of all kinds for everyone! Check back for more information in April 2019. Room sharing and carpooling are two excellent ways to save some money at the Conference. If you are interested in sharing a room with a fellow Conference attendee to bring cost down, or if you live within driving distance to the JW Marriott Austin and are interested in carpooling, you should consider joining the CC-IOCDF (Conference Chatter for Annual OCD Conference-Goers). This Yahoo Group is run by a group of volunteers who have attended the Conference in the past. It is a great place to learn about some firsthand experiences from attendees, and an effective way to meet other attendees who might be interested in room shares or carpooling opportunities. To join this discussion board, go to www.groups.yahoo.com/neo/groups/CC-OCF/info. You must sign in with a Yahoo username and password in order to participate — if you do not already have a Yahoo account, you must first create one and then sign in. Please note that the IOCDF does not manage or run this message board: We strongly encourage attendees to use caution and common sense when making plans for carpooling and room sharing.